Images are already used in creativity training, business coaching, and design research. Scientific problem-solving is facilitated by visual thinking. (Mathewson, 1999). But, after a productive day at the office, in left-brained email-and-execution mode, people don’t enter workshops or meetings geared up for innovation. By engaging in a quick right-brain warm-up, we come back to feeling confident in our creativity. 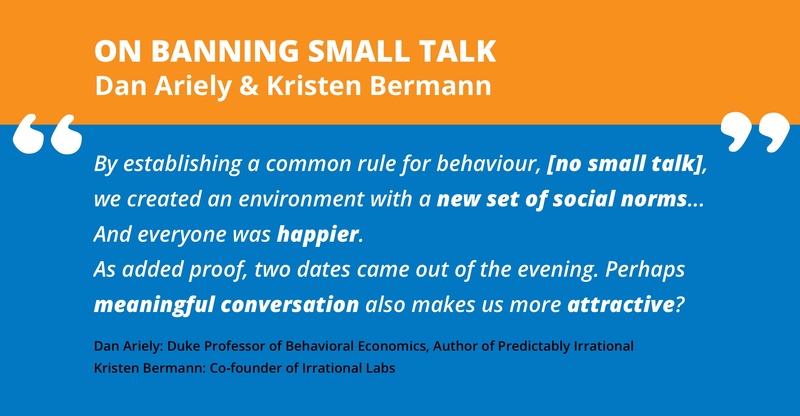 What happened when Dan Ariely had a No Small Talk dinner? Because without cards, anyone can say anything in conversation. But having choice actually makes it difficult and frictioned — Where should you start? Study 1: “30% (31) of the consumers in the limited-choice (6 jar) condition subsequently purchased a jar of Wilkin & Sons jam; in contrast, only 3% (4) of the consumers in the extensive-choice (24 jar) condition did so.” “Moreover, participants actually reported greater subsequent satisfaction with their selections…” when they had less choice. People, regardless of anxiousness, have a similar level level of positive feeling in intimate conversations, while those who are anxious feel more negative in small-talk conditions. So, How do we get from everyday conversations to a deep or interesting one? Frequently by accident, when something unexpected happens, with tipsiness or overflowing excitement. We’re often waiting for some invisible signal to tell us to move forward. What if we gave that permission directly? How might we make interesting conversations more effortless? Let’s do it together.